Professional-quality microphone with detachable cord is an economical solution when you need an extra microphone on hand. 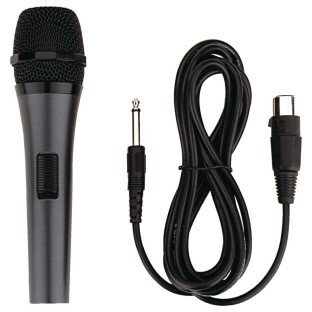 Comes with a standard microphone cable end that fits most all standard players. Very useful when calling Bingo! Great for use in our Assisted Living Facility. Everyone can hear when used in our Bingo or playing around with Karaoke. Had one that came with the PA I had bought from someone else and the mic broke. Bought one and purchased another when i used it because it worked so very well.